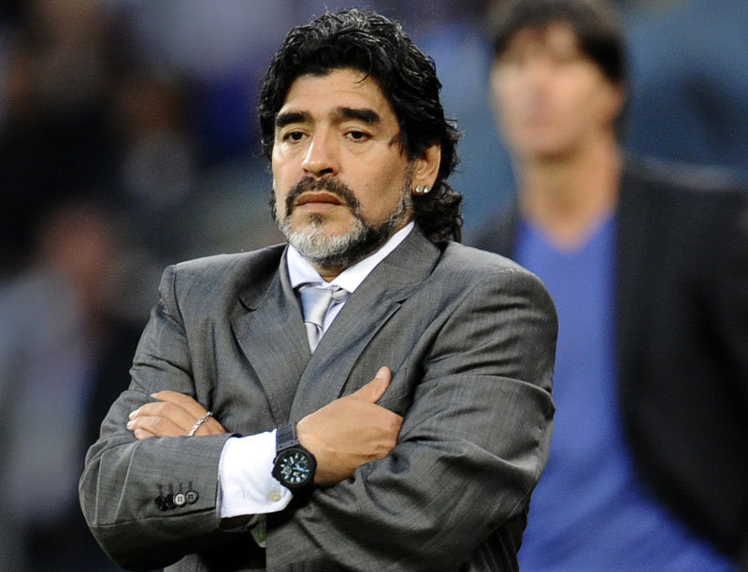 Napoli president Aurelio De Laurentiis says a global ambassador’s role will be offered to Diego Maradona—if the former club legend settles his score with the Italian tax man. Maradona was served with a tax bill of around 39 million euros (£33m) four years ago when he returned to Italy, where he led Napoli to their two Serie A titles in 1987 and 1990. De Laurentiis says once the dispute is settled, the 56-year-old Maradona, in Napoli to help celebrate the 30th anniversary of their maiden Serie A title, could be handed an official role at the club. “For me, Maradona is a legend... as soon as he resolves his issues over outstanding taxes, he will become our global ambassador,” said De Laurentiis, a film producer, on Monday evening. Despite the controversy that has followed Maradona on and off the pitch throughout his career, the player who became notorious for his ‘Hand of God’ goal against England at the 1986 World Cup remains a legend in Naples. Thirty-metre high murals of Maradona are painted on many of the city’s buildings while effigies, paintings and graffitti paying tribute to ‘Il Pibe d’Oro’ (the Golden Child), who joined the club from Barcelona in 1984, are omnipresent. Holding up his Napoli shirt to fans, Maradona claimed he rejected an offer by then Barcelona vice-president Joan Gaspart to double his salary to remain with the Catalan giants. “This shirt allowed me to dream,” added Maradona. “When I signed for Napoli, Gaspart wanted me to stay, he offered to double my salary. “I told him no, that I wanted to follow my heart. Napoli is beautiful and unique, but they need to win another two league titles to become an even bigger club. Napoli sit third in Serie A at four points behind leaders and champions Juventus and one point behind Roma.